Invertebrates make a larger contribution to garden biodiversity than any other group of macrofauna. They can be found living within our trees and flowers, in our soil, compost heaps and buildings and appear winged visitors, often in great numbers. Despite this, they are easily overlooked and it is only the largest, brightest and most readily identifiable species that we tend to notice. Many species are easily ignored, dismissed as being some form of generic 'fly' or 'moth'. Those observers who have taken the trouble to look at their garden invertebrates in more detail have discovered a fascinating community, including species that are of conservation concerning. For example, in a 30-year study of her small suburban Leicestershire garden, Jennifer Owen recorded 54% of Britain's ladybird species, 23% of our bees, 19% of our sawflies, 48% of our harvestmen and 15% of our centipedes. She even found four species new to science! 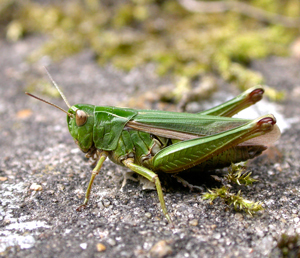 How can I encourage insects and other invertebrates in my garden?